. . . the ultimate comfort that takes clinical microscopy to new heights. Model 55i (left) and 50i (right). Eyepiece tube and digital camera are examples of configurations. 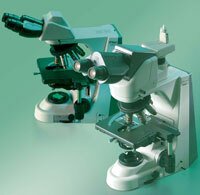 The 50i/55i series incorporates a host of stunning features that take the stress out of microscopy. A stay-in-position stage handle and tilting/telescoping ergonomic eyepiece tube ensure ideal viewing posture. Nikon's tried and tested infinity optics, the CFI60 system, which means you not only get the optimum optical performance, but you also have the freedom to add various accessories to create the setup that best suits your purpose.  With white LED illumination as its light source, this model is perfect for brightfield applications. even when brightness is changed.  When Ergo-View cytodiagnosis unit is installed, it maintains uniform brightness even if magnifications are changed.  Long lifecycle illumination consumes very little power.  Battery-drive capability using optional lithium batteries means model can be used anywhere.  Bright 6V-30W halogen lamp as light source.  ND8 filter is built-in as standard.  Enables brightfield, darkfield, epi-fluorescence, phase contrast and simple polarizing observations. Utilizing white LED illumination, the 55i is an ideal choice for brightfield applications. As the color temperature does not change even when the brightness is altered, adjusting the color balance filter or voltage is no longer necessary. The illuminator does not generate heat. Due to its minimal power consumption, the 55i has an extremely long lamp lifecycle, and its battery drive means it can be used anywhere. A new optional DSC port can be combined with an ergonomic tilting/telescoping tube to balance user needs for both digital-image capture and comfortable viewing. Including a 0.7X lens that is designed to optimize the image to the 2/3-inch CCD, the same area as that viewed through the eyepieces can be captured with a C-mount digital camera. A centering and focus adjustment mechanism is also provided. Highly acclaimed optics combine the CF design with infinity optics and utilize a 60mm parfocal distance, resulting in longer working distances and high N.A. 's, while producing crisp, clear images with minimal flare. The CF160 optics are perfect for both observations and capturing images with a digital camera, and they provide a flexible upgrade path to accommodate various accessories to meet individual applications. Eyepiece length is extendable up to 40mm. The new ergonomic tube can be inclined from 10? to 30?and the eyepieces can be extended 40mm. This ensures optimum eye point and a comfortable viewing posture, regardless of the operator's physique or if intermediate modules are being used. An optional eye-level riser* can raise the eye point in 25mm increments. The highly precise XY stage movement accurately responds to delicate adjustments of the stage handle. Frequent stage movement in pathology and diagnostic cytology can be conducted easily with the fingers. The compact design features a unique stage handle extension mechanism that allows adjustment of stage handle height for ease of use. Special hardened finish protects stage surface from scratches caused by repetitive changing of glass slide specimens. Frequently used controls and switches for adjusting the field diaphragm and illumination intensity have been concentrated in the lower part of the righthand side to minimize the operator's hand movements and enable operation without having to take your eyes off the specimen. 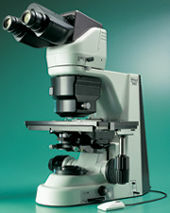 Utilizing computer-aided engineering (CAE), the new microscopes boast superb durability and stability, even during applications in which they are upgraded with various attachments. The compact Ergo-View cytodiagnosis unit has been developed for easier and more comfortable cytology examinations. Retrofittable to the 50i/55i, it can quickly move between 10X and 40X at the flip of a switch, utilizing a motorized mechanism.  Fast and accurate motorized magnification changeover with hand switch.  Unique quiet, vibration-free mechanism for magnification change ensures superb parfocality of images and no deviation in focusing.  Easy marking while observing the specimen through eyepieces.  Quick exchange of slides with one hand is possible by using an optional specimen holder for one slide. When the Ergo-View is mounted on the 55i, which utilizes white LED illumination, light intensity is automatically adjusted in conjunction with changes in magnification. Change between 10X and 40X at the flip of a switch. Marking is easily performed while observing the image. Quick-dry ink facilitates fast, clean marking.